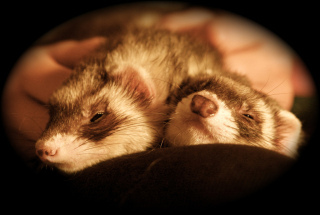 Sleepy Ferrets by Down At The Zoo, FlickrInterested in buying a ferret, but don't know what you'll need to start it off right? The supplies you choose for your ferret can make all the difference. For this reason, it's important to buy the right supplies to give your new ferret a start in a comfortable environment. Get your ferret started off right with these necessary supplies. The right cage will be both a bedroom and a home for your pet ferret, so it's important to choose carefully. The cage you choose should be at least 20 inches wide, 30 inches long, and be made of wire to provide your ferret with good airflow to prevent respiration problems. The ideal cage will have split levels, so your ferret can climb. Super Pet and Prevue Hendryx both offer great ferret cages. Your ferret will need a good food dish that can't be easily tipped. For this reason, it's best to find a food dish like Super Pet Small Animal Hang-N-Lock Corner Crock that can attach to your ferret's cage. You'll need a good water bottle too, that will keep your ferrets water fresh and clean. Super Pet offers an easy to install water bottle that will fit well in your ferret's cage. Your ferret will need a very specific diet, rich in both protein and animal fat. For the best results, search for a ferret food that has poultry or chicken listed as the first ingredient. Totally Ferret Active Diet and Path Valley Farm Crunchy Ferret Food are both great choices. Ferrets Hanging Out In Cage by Metta Matt, FlickrYour cage should have a few hammocks or sleep sacks installed so your ferret can sleep comfortably. 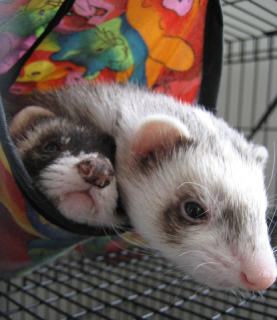 Your ferret might enjoy Marshall Ferret Leisure Lounge or Ware Double Fleece Hang-N-Hammock. On top of a comfortable place to sleep, your ferret will also need toys to keep his mind occupied. Some safe ferret toys include the Pop-N-Play Ball Pit or the Ferret Octo-Play. The options are almost endless! In order to keep your ferrets cage nice and clean, you'll need to litter train him. To do this you'll need a high-backed litter pan, non-clumping clay-free litter, and a litter scoop. Once you have the litter pan all set up, be sure to keep it away from your ferret's food and sleeping area. Be sure that you keep the litter as clean as possible. These 5 necessary supplies will keep your ferret happy and entertained. Be sure to offer your ferret the care and love that he deserves, and have fun! Dark Ferrets of the Sith! The Animal Video Of The Day!!! What's It Like To Have a Pet Ferret?